Sauté onion in oil in large nonstick skillet over medium heat until tender, 3 to 5 minutes. Add water and bouillon; stir until bouillon is dissolved. 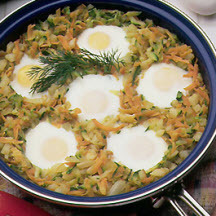 Add carrots, potatoes, zucchini and dill; mix well. Cook, covered, over medium heat until heated through, about 10 minutes. Press 6 indentations (about 2-inch diameter) into vegetable mixture with back of spoon. Nutritional Information Per Serving (1/4 of recipe): Calories: 196; Total Fat: 9g; Saturated Fat: 3g; Cholesterol: 317mg; Total Carbs: 18g; Fiber: 3g; Protein: 12g; Sodium: 347mg.